The enterprise is ready for advanced technologies such as augmented reality. Microsoft partner Object Theory tells you how its done. Object Theory is a company on a mission. The Microsoft Mixed Reality partner is a rarity in today’s AR market — it’s strictly focused on the enterprise customer. Today, that means working with Fortune 1000 companies to deploy HoloLens and Windows mixed-reality solutions in the enterprise in a variety of use cases; for example, internal workforce ultilization, customer or marketing initiatives to showcase company innovation, or it might be in certain verticals within these companies. By contrast, other partner-program members might focus on marketing, consumer brand, or media and entertainment. “What we’re finding is that there [are] a lot of strong use-case verticals right out of the gate. [We’re seeing] traction in medical, automotive, aerospace, public sector, defense, manufacturing and architecture, engineering and construction,” Raven Zachary, co-founder of Object Theory, told us. The common thread among these verticals is that they work with 3-D content and feel limited by only being able to view this content on a 2-D monitor. Technology like HoloLens and Windows mixed-reality-powered devices allow users to take content that’s inherently 3-D, move it off of the 2-D monitor and into the physical world in a way that’s much more complimentary to the content they’re trying to visualize or experience. Portland, Oregon-based Object Theory is a three-year old HoloLens software and design firm with eight employees and a handful of contractors. The company was among the first wave of partners, in the summer of 2015, to join Microsoft’s Mixed Reality Program, even before the first HoloLens shipped. Object Theory graduated from the training program in early 2016. Zachary is no stranger to technology entrepreneurship; he’s been at it for 27 years. Prior to Object Theory, he had a mobile-app company that built iPhone, Android and mobile-web apps for large brands such as Starbucks, Whole Foods, Amazon, Ticketmaster and Zipcar. He also built the Obama app for the former President’s campaign. The company was sold to Walmart, where Zachary spent three years looking at the future of mobile in the retail environment and how mobile phones impact the shopping habits of shoppers both in the store and online. In his spare time, Zachary was researching VR. He found that the more he learned, the more he discovered it wasn’t the right fit, in all cases, for the enterprise. Then he watched the livestream media event for the HoloLens. “I was blown away by what I saw and knew that this was it, this was my next venture, the technology that I wanted to focus on,” he said. Turns out, Zachary knew a guy on the HoloLens team; sychronicity happened and Michael Hoffman and Zachary founded Object Theory. Together, Hoffman and Zachary have been bringing AR to business customers. They’re finding great success with Prism, a collaborative technology they created for the HoloLens, that bridges the gap between workers in distant locations with a shared experience. The application is powered by the Object Theory Mixed Reality Collaboration Service. How it works? 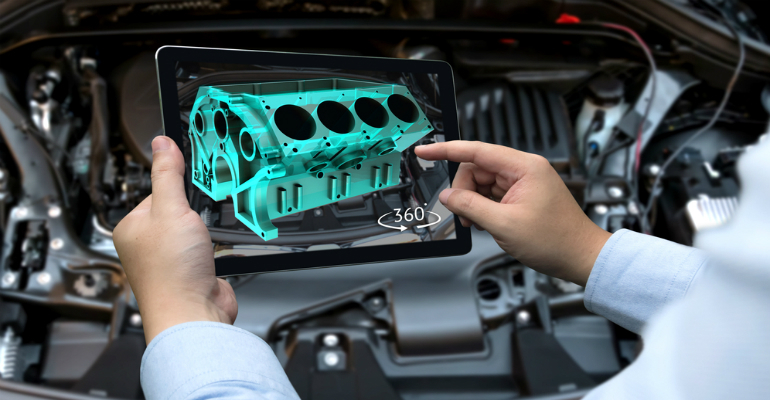 Each member in a session is represented by an avatar; there’s 3-D spacial sound and content sharing, allowing participants to have a shared experience to discuss three-dimensional objects and environments in true 3-D.
A large auto manufacturer uses a customized solution of the technology for internal teams to have discussions and review. “They’re currently piloting it to bring designers across multiple locations and campuses together to have a shared session and discussion — that’s much more inclusive and immersive than a speakerphone,” Zachary said. Object Theory is also working with a large consumer-products manufacturer on package design. The client wants to be able to visualize a package in 3-D, have discussions about colors, materials and how it compares to other physical products before spending money on assembly for the package design. The Microsoft Mixed Reality Program partner has done about a dozen projects in two-and-a-half years. In addition to the top five vertical markets where AR is gaining traction, Zachary also has a top-five horizontal use cases based on his company’s experience: collaboration; remote expert, or bridging service technicians in the field with specialized knowledge back at headquarters; training; sales, or visualizing the product in the field prior to purchase; and product and space design in alignment with Microsoft’s Modern Workplace. For example, a retail-space planning solution that allows companies to reconfigure stores, build-outs or design of promotional end-cap displays in the store, ahead of execution. It might be a no-brainer for companies working with 3-D content to lead the charge toward AR, but what about vertical industries, such as financial services, that are dominated by 2-D content, such as reports, charts and graphs? Even with less compelling applications, these firms shouldn’t be dismissed. “There are companies [in these verticals] that are also interested in visualizing complex data in 3-D,” said Zachary. In short, it’s coming. An evangelist for AR, Zachary encourages partners interested in embracing this future opportunity to apply to Microsoft’s Mixed Reality Program. For partners not quite ready to embrace 3-D in their businesses, there’s an opportunity to do partner-to-partner work to deliver solutions, while developing knowledge about 3-D at the same time. The Microsoft Mixed Reality Partner Program recently expanded and is now open to systems integrators, ISVs and digital agencies worldwide. The initial iteration of the program – the Agency Readiness Program – targeted digital agencies only, and had 25 members. Since the program expansion last July, it has added 75 partners, and there’s pent-up demand to join. “Partners can’t just raise their hand and say they want to join the Mixed Reality Partner Program; they have to apply,” Paul Corriveau, director, channel and partner marketing for the mixed reality business at Microsoft, told us. Also, don’t bother applying if you can’t show a customer proof of concept — that’s a prerequisite to join the program. Members demonstrate strong expertise in development and/or deployment of mixed-reality applications. Microsoft interviews the partner organization and the customer with whom they did the proof of concept. “We evaluate them and either train them for 12 weeks or we fast track them into the program,” Corriveau said. The initial mixed-reality program was about readiness. Today, it’s multifaceted with Microsoft working closely with partners on sales, joint marketing and sales, account planning, account targeting, pipeline management and continued training. It gives program members direct access to Microsoft’s product team.